A dynamic and healthy economy will always be undergoing a process of churn: new companies and new jobs starting, but also existing companies and jobs ending. Thus, it's been troubling to see articles about "The Decline in US Entrepreneurship", a lower rate of business startups, and a decline in how much new firms are offering in terms of job gains. The Kauffman Foundation does regular surveys of US entrepreneurship. Robert Fairlie, Sameeksha Desai, and A.J. Herrmann wrote up the 2017 National Report on Early Stage Entrepreneurship (February 2019). The report offers some reasons for modest encouragement, but in the end, seems overly optimistic to me. On the positive side, the survey uses data from the nationally representative Current Population Survey conducted by the Census Bureau to calculate the "rate of new entrepreneurs." 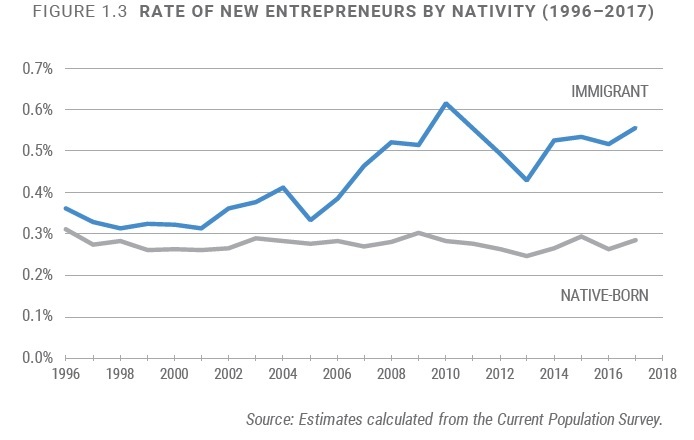 Specifically: "The rate of new entrepreneurs captures the percentage of the adult, non-business owner population that starts a business each month. This indicator captures all new business owners, including those who own incorporated or unincorporated businesses, and those who are employers or non-employers." 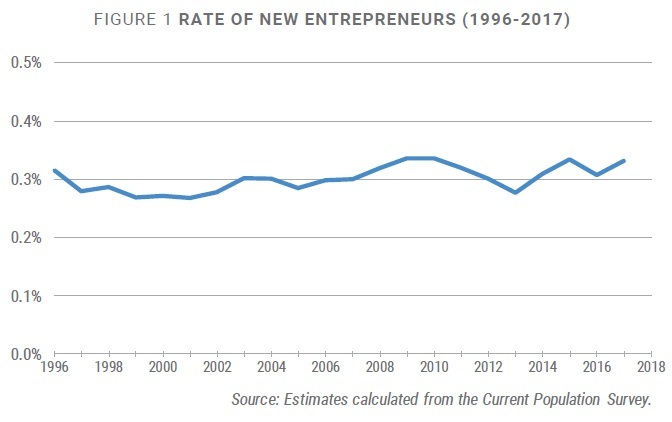 As the report notes: "The rate of new entrepreneurs in 2017 was 0.33 percent, which reflects that 330 out of every 100,000 adults became new entrepreneurs in an average month." Overall, the Kauffman report is optimistic about early-stage entrepreneurship in 2017. But some of the results of the survey, as well as data from the Business Dynamics Statistics produced by the Census Bureau offer some reason for concern. For example, when one breaks down the rate of new entrepreneurs in more detail, it turns out that those with less than a high school education have a rising rate of starting firms--unlike any other educational group.